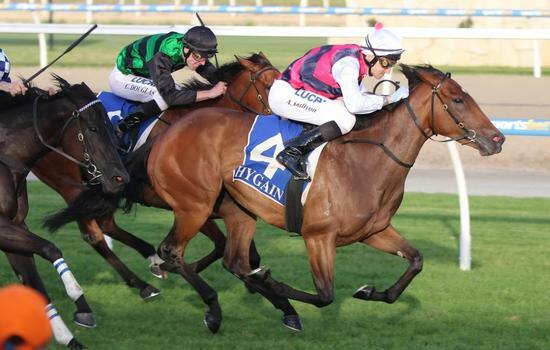 A bigger track, a couple of race day experiences and an extra 100m saw the promising filly Influential Girl break her maiden in dominant fashion at Pakenham on Thursday night. Having just her third start, the daughter of one of our favourite stallions Magnus was kept very safe in the betting having run such encouraging races at her first two starts. Finding her rivals a little sharp over 1100m at Kyneton at her previous outing, Influential Girl was afforded a lovely run by Andrew Mallyon who had her tucked into a midfield position, always travelling well..
Getting a nice cart into the race from the turn, the bay got into the clear into the straight and from the 200m was able to get away from them, her winning margin a soft 3/4 length. "I just wanted to have her in a spot where she'd be nice and comfortable," Mallyon reported. "She is not very big but she tries hard and with that softer run she was able to show me a really nice turn of foot - which she held all the way to the line." "She definitely has plenty of ability and she tries her heart out." "From her first start," Mallyon added, "she has continually improved. She just got run off her feet a little bit on the smaller track last start, on the bigger course today she was able to really travel." "She is only a little girl," said the stable's Jade Matthews, "but she's got a very big heart and Andrew rode her perfectly." "She didn't quite know what to do at Kyneton when they went a bit fast for her but with that bit more ground tonight she didn't have to be chasing the whole race, she was able to settle and she hit the line so well." "I am rapt for her team of owners, most of them are here and they are having a great night!" Several of those owners, including Peter and Larissa Joyce, also raced Influential Girl's dam Influential Miss whose four wins included a Melbourne Cup Day success at Flemington back in 2010. Influential Girl is the first home-bred winner for Peter and Larissa who could not have been more delighted - "all wins are great," they enthused, "but this one is pretty close to the heart!" Not served last year, Influential Miss has a yet to be named two-year-old full brother to Influential Girl being educated and she is also dam of a Wanted yearling filly. She hails from a strong international family whose members include the big race winners Halfway To Heaven, Rhododendron, Photo Call and Magical who just a few weeks ago was second to Enable in the Breeders Cup Turf.